Artwork of Arjuna was done by Dr.Nandalal Bose at Kalabavan Shanthiniketan (02.01.1944) and gifted to his admirable student A.D.Jayathilake. He was a student from Ceylon (Sri Lanka) and had the opportunity to study under Dr.Nandalal Bose in the final batch (1948-1952). Growth of peculiar tree types can be seen near river banks as a formation of a large trees with a buttressed, spreading base and horizontally spreading branches, and woody, dark brown which can resist to high pressure floods and in the past some of the Old masters burnt the wood for ashes and used as a white colour pigment. There are different types of species found as Arjuna Tree and still we can see a typical tree at Savapalli Shanthiniketan. Dr.Nandalal compared Arjuna Tree to Arjuna, a heroic character with courage who stood through thick and thin with lord Krishna in the war narrated in the great epic of Mahabaratha in India. 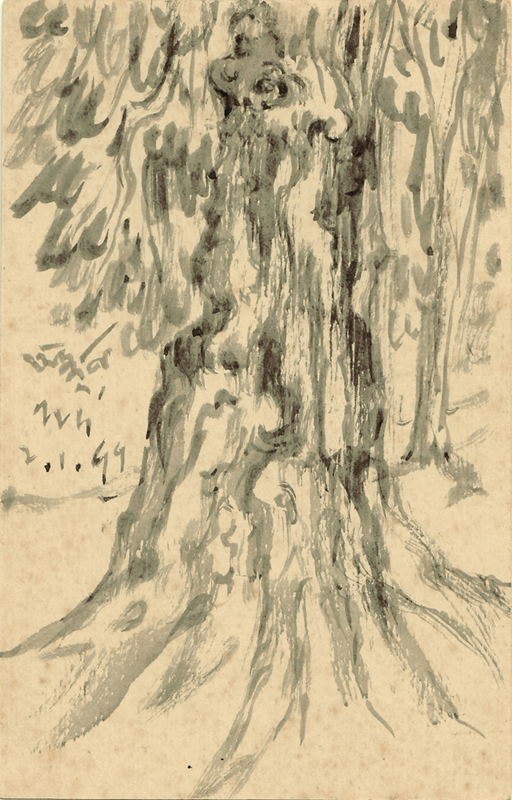 He brought out the typical character of the Arjuna tree, masterly using dry brush in Chinese ink on paper. As a result of this technique no copy will be available as a version and it has become unique. Places of display, collection & galleries of the paintings of Nandalal Bose.